Volkswagen's most efficient petrol-engined Golf will go on sale this month. The BlueMotion TSI is powered by a turbocharged 1.0-litre three-cylinder engine and returns a claimed 65.7mpg with 99g/km of CO2. Priced from £19,740, it's the first BlueMotion Golf to be powered by a petrol engine which it shares with the Volkswagen Up. The 115PS unit still gives decent performance with a 0-62mph time of 9.7 seconds, helped by 200Nm of torque. The standard gearbox is a six-speed manual while a seven-speed DSG is also available with no effect on fuel consumption. To improve economy, the BlueMotion TSI has a 15mm lower ride height and special underfloor panels which improve aerodynamics. As with most eco-specials, it also has low rolling resistance tyres although Volkswagen has dropped the cam chain for a toothed belt in order to reduce friction and there's no sare wheel - only a tyre repair kit. 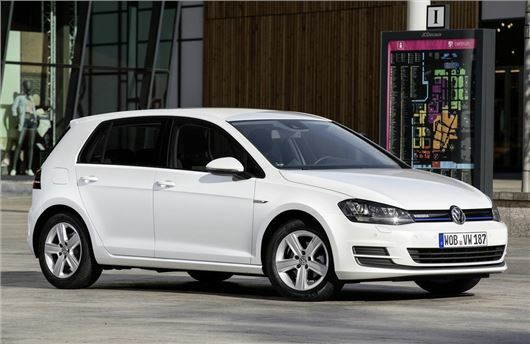 The Golf BlueMotion TSI is available as a three or five door hatch as well as being offered in the Golf Estate and Golf SV - the replacement for the Golf Plus. It comes as standard in Match trim so gets 16-inch alloy wheels, seven airbags, cruise control plus the XDS cornering system.